It’s another exciting week outside my work – some music stuff, photography stuff, tech stuff… well, isn’t that what my blog is all about? D-Link is one of the brands that recently reach out to me for engagement. Their price? Courier fees to deliver the products to me for review. I do not charge for attending events and reviewing products, but I am picky about which products to review (hopefully that does not result in a horde of products coming my way from today!). If you read my reviews carefully, you can see that I dedicate time to test the products and give my thoughts. So, if I don’t have any affinity with the products I am provided, it is not possible for me to write a good article. Anyway, D-Link has passed me a product which is a Wi-Fi Audio Extender. What does it do? Well, look out for my review next week! But if you are looking at re-purposing your old stereo set to stream music, this is the product to get! Philips is also another brand that is going strong on social media engagement. They invited me to their launch of Fidelio 2015 audio line. None of them costs below S$400, so Philips is targeting at audiophiles and music lovers. I’ll talk more in a separate article because there are a sizable content to share. Watch out for my article posting next week. While browsing my social feed, I came across this Taiwan artist and somehow she caught my attention. Dug deeper and found her songs. She composes music and writes lyrics for all her songs. The strangest part is how she pronounces the Mandarin words. It is borderline irritating, yet distinctively stylish. I love ballads, so I’m gonna share this YouTube video here for your enjoyment. She reminds me of Cheer Chen, a Taiwan indie singer with a healthy fan base. I wish her the best in her music career. We need unique artists like her to offer diversity in the Chinese music industry, something that the Western countries are doing really well. RoomiesCD Vol. 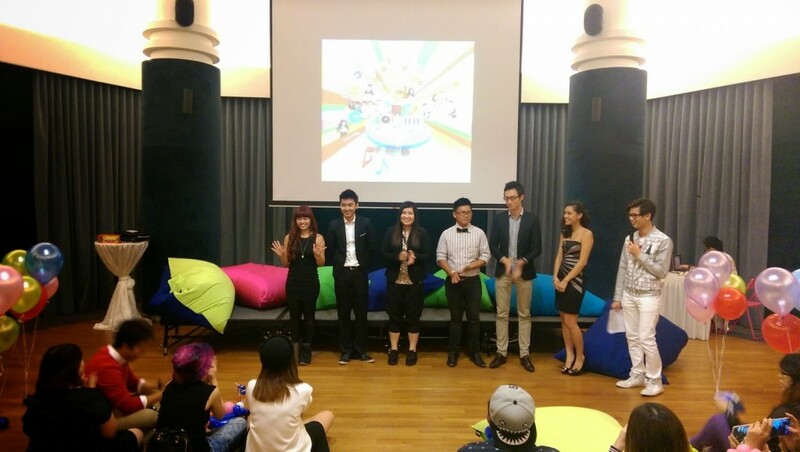 1, entitled “In Our Voices” comprises of 10 original songs written and composed by Singapore local artistes: indie band MuTouRen 木头人, NEA Eco Music Challenge 2013 finalist Good Morning!,YouTube’s Latest Sensation Steve Xavier Soh, and award-winning Natalie Hiong & Mint Leong. The launch event was a cozy affair with an informal setting. 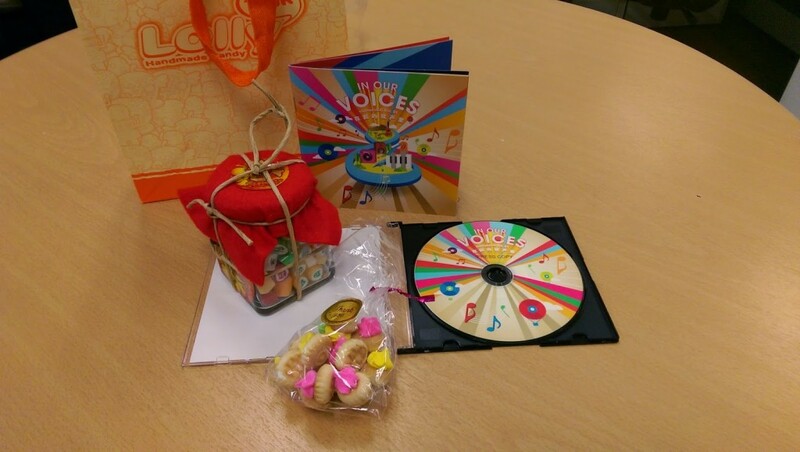 I left early due to other commitments but I met Mint the following day to collect my press kit which consists of the pre-mastered CD and a bottle of candy from LollyTalk, a local candy brand. The objective of RoomiesWorld is to offer a platform for local musicians to be featured. Indeed, Singapore needs a lot of such avenues so that people who wants to check out local music can do so. Performing in gigs is a laborious way to be heard: the performers must spend time to perform while the audience has to be there to listen. With platforms like RoomiesWorld, one can check them out online at the comfort of their homes. 收听快乐 (Shou Ting Kuai Le), CNY 2015 song featuring Mediacorp Radio DJs! InTune Music School has released a music video written by Peng Chi Sheng, featuring MediaCorp Radio DJs and several local indie artists like Aaron Matthew Lim, Bevlyn Khoo, Elaine Lam, Dawn Wong, Lorraine Tan. Production is well done and do share this MV and spread the festive mood this coming Lunar New Year. The World Photography Organisation has launched a new award dedicated to mobile photography. Photographers have up to 27 Feb to submit their best image inspired by the brief – “You get out of life what you put in. Push past the obvious and see the inspiration all around you. Discover the extraordinary by using your mobile phone to view the world through a different lens.” One winner will be chosen via a public vote, and will be flown to London to attend the Sony World Photography Awards (SWPA) gala ceremony on 23 April 2015. Entries are free at www.worldphoto.org .